The Broke and the Bookish : Natanya's Ramblings on "The Red Tent"
The Hebrew Bible (the Torah) contains a brief narrative of a horrible incident surrounding Dinah, the only daughter of Jacob, father of twelve boys—who later became the twelve tribes of Israel—and husband to four women. Though it is implied in the Torah that Dinah was raped, she never speaks during this narrative, begging the question of what actually happened. In The Red Tent, Diamant allows Dinah to tell her story, beginning with the story of her mothers and continuing through her upbringing, the horrible event, and all the way to the end of her life. While the book is technically split into three parts, as I read it there was a definite shift from the first to the second half. The first half is more like background information, largely cultural, and leading up to the event described in the Bible. What I would call the second half depicts the event, its aftermath, and the rest of Dinah’s life, and reads more like a regular novel. While in most novels this much background information would get tedious, here is does nothing of the sort, and in fact is the reason I loved Diamant’s novel so much. The front cover of The Red Tent quotes author James Carroll, who said of Diamant's novel that “The oldest story of all could never seem more original, or more true.” While I hate to be the reviewer using someone else’s quotation, those last two words perfectly articulate what I felt as I read this beautifully written story: it seems so true. Having grown up hearing and reading the stories of Judaism’s forefathers and foremothers, Diamant’s novel brought to life all of those stories and commentaries. As I read, I could practically see each event unfolding, and had no trouble believing that it all really did happen. Particularly in the first half of the novel, I had fun trying to figure out which events were ones I had read before but forgotten, or ones from Diamant’s own imagination, which made reading The Red Tent even more enjoyable. While it is probably useful to have at least some cursory knowledge of the stories of Abraham, Isaac, Jacob, and Jacob’s family, it is by no means necessary to be completely familiar with them prior to reading The Red Tent; Diamant briefly reviews each significant event, and even someone with no knowledge whatsoever of these Jewish ancestors should still get more than enough out of this piece of historical fiction (or midrash, the term for such commentary on the Torah, which literally translates as “investigation” or “study”). Keeping track of all of the characters might be difficult without prior knowledge of who they are, but this is really no fault of the author—the Torah is insane when it comes to names. Diamant’s story is unlike any I have read. Through the lips of young, curious, exuberant Dinah, Diamant makes these lifestyles enviable. I never thought I would yearn to live in tents and travel for many days or weeks just to get a short distance away (though only short by today’s standards), singing as I walk along with all of my belongings and family members. Beautifully and elegantly crafted, The Red Tent drew me into a world completely unlike my own, but one whose existence I easily accepted. Whether or not this is what actually happened to Dinah, this midrash is one worth reading. I've had this book on my shelf for a while and I've been dying to read it!! Excellent review! In college I took some Old Testament classes and so I'm really just fascinated by this book and I feel like you rarely see historical fiction from this time! I read this a long time ago, but I remember it as you described it. I'm even more familiar with the Biblical stories now, as since I first read this I've also read some of the Old Testament. I should reread it someday. When I have time. Great review! 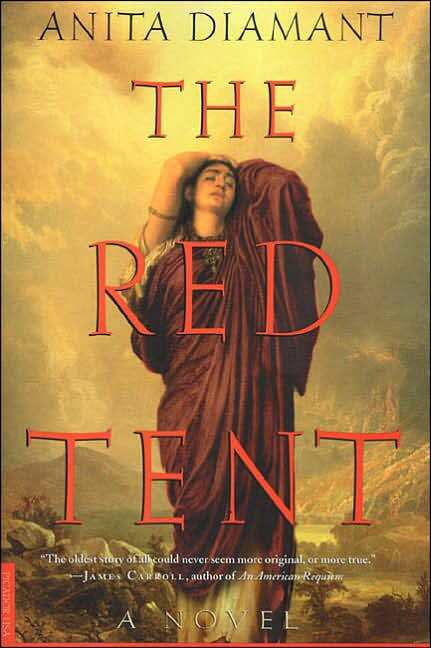 I just finished reading The Red Tent this week, and it's such a fantastic novel. I liked that the first half was more of a family narrative, while the second half focused more on Dinah's own experiences. I loved this book too! Diamant did such a lovely job of bringing the women of the Torah to life. And I agree with how you described it that the story came across as "so true". Nice review! I read this book about a year ago. I loved it. I thought it was so beautifully written. I agree with all of the comments and the review as well. I really enjoyed this book. The only things I know about Dinah and the women I learned in 4th or 5th grade in my religion classes. But they never really went into the women's story. So that was interesting. It was a really good book that I would reccomend if you like lit about women or religion or just good stories overall. I've never heard of this book before, but it sounds very interesting. I loved this book! I'm with you, I liked the first half better when she was with her family. Great review! I have to admit but I tried, I really tried to read this book last year but it just couldn't continue my interest. Your review does make me want to reconsider that and give it another try. Great job! Great review: I loved this book too! Though I've tried Diamant's other books and not enjoyed them so much. It would have been easy for this book to be crass or sound false, but I thought it was really moving. I read this years ago, I think right after it came out. I really enjoyed it without any real knowledge of the biblical story. I think your review describes this book (from what I recall) rather perfectly. I read this one pre-blog and enjoyed it quite a bit. I agree with you about the first half being better than the second. Nice review!